Our founder story wouldn’t be complete without getting a look into both sides of the story. Notion’s Co-Founder and CTO Ryan Margoles gives some insight on the hardware side of startups and working with Techstars. I like to say I took a 5th year victory lap at CU-Boulder while I was getting a degree in both engineering and business. After graduating I landed in SoCal working for the golf company Titleist on a new swing sensing system. I worked with golf pros and used all kinds of sensor technologies to help change the way Titleist made their clubs. After Titleist I went on to work at Callaway and then finally made the transition to put all my time into Notion and move to Denver. Techstars was a huge leap for you guys as entrepreneurs, what was that experience like? Over the course of Techstars, we met with world renowned thought leaders, industry experts, mentors, entrepreneurs and many others. We attended workshops on branding, customer acquisition, pricing, marketing strategy, culture building, customer service, leadership, hiring/firing, and negotiation. We even practiced pitching with a barrage of ping pong balls being thrown at us to simulate a challenging environment. During Techstars we also launched Kickstarter, filed patents, ran our 3D printer nonstop, stayed up way too late coding, challenged anyone and everyone on the Techstars ping pong table, went to team-building events at ropes courses, ate goldfish crackers for all three meals in a day, combined the oriental and chicken flavors of Ramen noodles just to mix it up, and slept on air mattresses for 3 straight months! How did you land on such a modern design for the sensors? We landed on the general shape because a round object doesn’t require the user to orient the device to be parallel to walls, ceilings or floors. Also turns out most smoke alarms are round for this reason. In our initial industrial design concepts, we did have a few square options but after testing them, we found the orientation concerns to be too prohibitive. We decided to go round in order to make the setup process as easy and headache-free as possible. As we progressed towards launch, we brought in a handful of industrial designers to really bring the aesthetic of the product to life. We’ve long felt the competition in the space has relied on the cheapest, quickest-to-produce enclosures without any focus on design or purpose. Our manufacturing team was very keen on the idea that a great looking part doesn’t have to cost more — which we’ve very much been able to prove! In the end, we chose to go with a design that inspires mindfulness. It’s inclusive of all decor, it isn’t flashy but it does emote a level of confidence and capability that catches the eye when it is noticed. Was the name “Notion” always the plan? Actually the original name for the company was “D-Techt,” with the thought that we “detect” things…and we’re a tech company. Perhaps not the best pun, but hey, we tried! From there, we moved on to Loop Labs, but in the end we landed on Notion. What was one of the biggest challenges you faced leading up to launch? One of the biggest challenges Notion faced is one that most hardware startups face: prototyping. Hardware is much different than software in that it’s…hard! In software development, you have the luxury of continuous iteration and improvement through version updates and in many cases, automatic deployment of changes. Which isn’t to say it’s a lesser proposition than hardware by any means, but building a hardware company is akin to having two startups: one to build the product, one to program it. For hardware companies, the prototyping phase is key because that’s when you validate your concept. The problem is, building prototypes is an expensive endeavor, and that’s where 3D printers came in for us. This phase was also crucial for the team to start testing, it opened up the opportunity to collect customer feedback, and it was ultimately a fundamental piece for successful fundraising. What led you to the idea of a single sensor? Our detailed consumer research showed that most people want to dabble with the connected home but they aren’t ready to commit to the cost and learning curve of re-outfitting their entire home. Plus, with so many different products on the market, it can be confusing to know which products to invest in. We designed Notion to be easy-to-use, and took the element of choice out of the purchasing equation by making our device multi-functional. Sounds, leaks, temperatures, movement — they’re all events that a homeowner should know about, but may not be keeping track of. 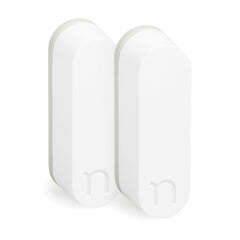 Notion’s single sensor can retrofit almost any object and turn it into a smart one. 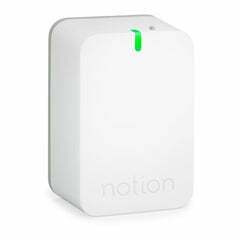 What do you see Notion’s relationship with the smart home being? Like I mentioned earlier, to work our way into the smart home world, we took a different approach to connecting your home: retrofitting versus re-outfitting. We believe the first step to a more mindful home is simply being aware of the happenings within. What good is a smoke alarm if no one is around to hear it? Did I leave the garage door open on my way to work? What’s the temperature of my baby’s bedroom? Notion is flexible and customizable to a point that the technology empowers people to answer the questions they find themselves asking the most, all at a much lower cost than swapping out all their “dumb” home monitoring devices for smarter ones.